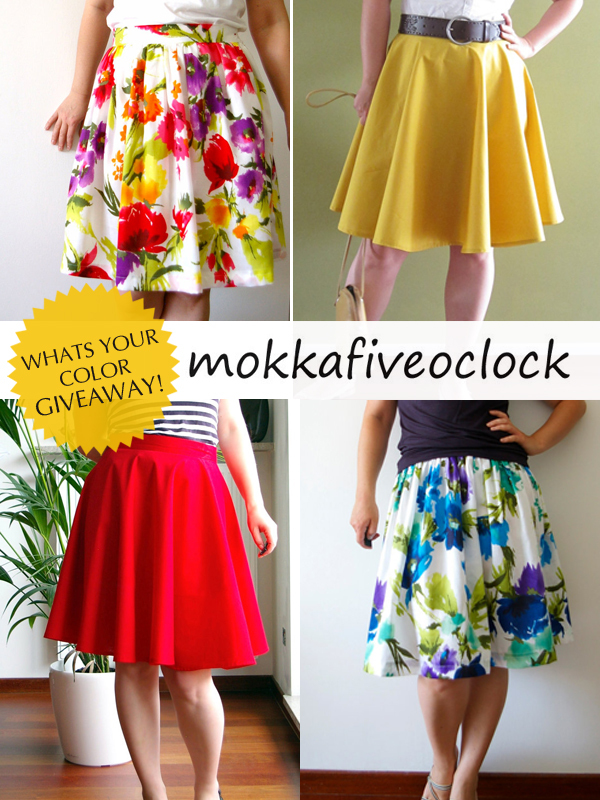 These gorgeous skirt designs are from Monika, the designer behind Mokkafiveoclock! I am head over heels for this one. They are the perfect summer skirts! She is generously offering a reader their choice of skirt from her etsy shop! 1. Visit Monika's shop, and let us know which skirt is catching your eye! 2. Become a fan of Mokkafiveoclock on facebook! 3. Blog, Tweet, or Facebook about the giveaway! **Open to international readers!! Will announce the winner next Tuesday! (oh yeah, and i'm an IHOD follower). ps - i like her shop on FB. I have three that I like, but I am going to be adult about this and choose one. i like the peonies spring mint and pink skirt. I love the iris blue fulled gathered skirt! super cute stuff! These are so cute! I love the happy yellow summer circle skirt! obvs following u. i LOVE the red circle skirt. I love the yellow skirt! So adorable and perfect for summer! What pretty, pretty skirts! I love the Flower Bouquet summer skirt the most. I am loving the Floral Summer Skirt. So cute! Gosh, it's such a hard decision, I want every one! I love that they are modest and so feminine! I love the one you love and the Vintage inspired - Blue flowers skirt. And Vintage inspired peonies skirt - spring mint and pink. Gosh, I want! I like the vintage inspired funny blue skirt! It's precious! I love all of them but especially the yellow one!!! exciting!! I love them all but the happy yellow summer one definitely catches me eye the most, yeay. Oh and the Vintage inspired floral summer skirt one too - beautiful. Love the vintage peonies skirt. I've been looking for the perfect red skirt and have yet to find one! I'm going to have to say the red summer circle one is my fav! The yellow one comes in second though. I'm loving yellow! I love this shop! And I love the vintage inspired summer floral skirt! I love the blue circle skirt! So pretty!! I love the vintage inspired "funny blue skirt"!! this is great!! i'm loving the yellow one! perfect for summer! Ahh I love anything floral. I'd pick the vintage peonies skirt! I love the vintage peonies skirt too! So pretty! i love the vintage inspired floral summer skirt! so cute! i've had my eye on this shop for some time! love love love the yellow circle skirt! Oh wow, I love the fabrics she uses. Definitely twirl worthy. My fave would have to be the floral summer skirt. I am a fan of Mokkafiveoclock on facebook! Following you :) I love the circle skirt in blue! And we tweet tweet tweeted! What a great giveaway!! I adore the yellow summer circle!! Of course I am a follower!! I liked them on facebook!! Fingers crossed!! I like the same skirt as you and the Happy Yellow Circle skirt. Both combat the rainy weather we are having in Geneva right now. i like the red. i don't have a red skirt. kate(_)lanahan(at)hotmail(dot)com. I love the Vintage inspired peonies skirt! I absolutely love the Vintage Inspired Funny Blue Skirt--it would look amazing with some cute wedge sandals! I like the blue irises and peonies skirt. The Peonies in Spring Mint and Pink, so romantic! Thanks for the lovely giveaway. I follow and love the Circle skirt - blue! The Happy Yellow Summer Circle skirt!!! I love the happy yellow summer circle skirt! p.s. i'm a new follower of yours :] i follow Mokina's blog, so that's how i've found your stinkin cutie of a blog! So strange... none of my comments posted yesterday. I'll try again. I'm a fan of Mokkafiveoclock on FB! i love the "Funny Blue Skirt"! and i shared on FB too! fun giveaway, thanks! ooh how pretty!! I heart this skirt - Narcissus, poppies and irises! I tweeted for you too! I would just about give my left arm for the happy yellow summer circle skirt. I love yello! the blue circle skirt is my favorite. such a beautiful color! a skirt giveaway!?!? no way!!! there is soo many that i love but one of my faves is the Vintage inspired floral summer skirt - So delicate!! soo pretty!! my favorite is.. the Full gathered skirt -Narcissus, poppies and irises! I like the Happy Yellow Summer circle skirt! LOVE these skirts! I'm in love with the blue Irises & peonies skirt. GORGEOUS print. Just liked Mokkafiveoclock on FB! I am skirt OBSESSED. I didn't realize it until I was looking back at my latest outfit posts and all I am wearing are skirts. I follow and would love Flower bouquet summer skirt.